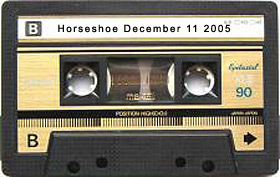 Details: The Rheostatics, live at the Legendary Horseshoe Tavern in Toronto, December 11, 2005. Ford Pier on keyboards. This was the 4th show of their 10 night Fall Nationals run at the Horseshoe (All ages Sunday afternoon set). 8 track files provided by Steve Clarkson - mixed by Darrin Cappe with a bit of track specific compression, gain, limiting and slight reverb to drum and vocal tracks. The Keyboard track had some technical issues and was shorting during the entire show - I have salvaged it where possible but removed it where it was providing noise. Recording starts at the end of Home Again - not sure what was played prior.